I love trying out new patterns, especially when they come from a fellow blogger. I often don't have the time to try them out, but this weekend I wanted to make a special little something for my sister-in-law who was visiting from Vancouver. 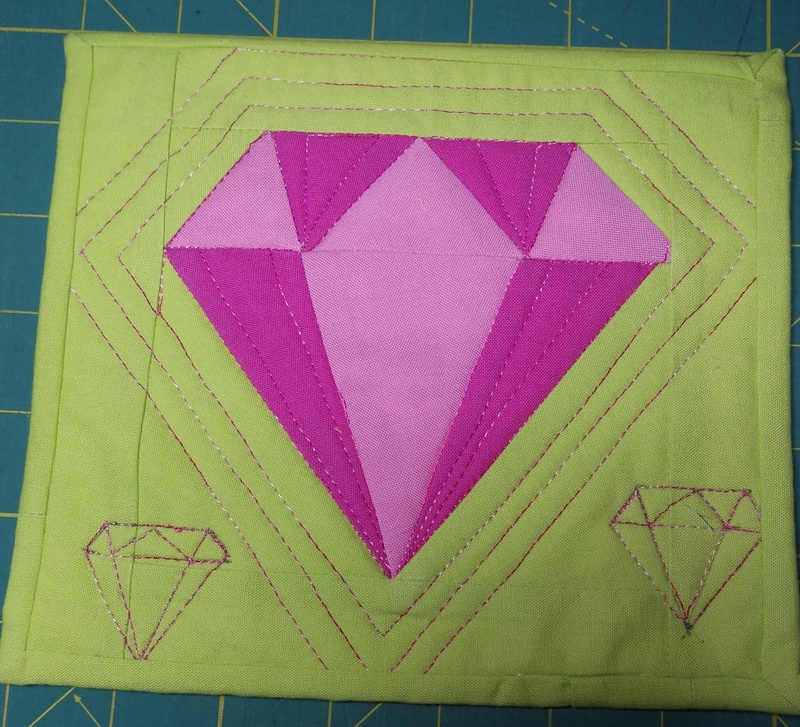 This foundation paper pieced diamond block is one of 9 diamonds that make up the Hodge Podge Diamond in the Rough mini quilt. It was created by Sherry of Powered by Quilting. Here is Sherry's pattern. Isn't it lovely? I meant to use a very light pink for the middle triangle of the diamond but forgot about it. I think that it's fine. Sherry's mini is really cute and uses printed commercial fabric that looks really nice. In a quilt with 9 diamonds, it's really effective. I wasn't too sure how to quilt it but Sherry had used some echo lines that were very effective. I couldn't do quite the same thing since I only made one block, so my quilting is much simpler. I'm not thrilled with my choice of variegated thread, at least for the echoing on the green. It does look better in person. Great News! Dione of Clever Chameleon Quilting has featured this Diamond Mini. Thanks Dione! Materials: Kona cottons and King Tut variegated thread by Superior Threads. So lovely. I love the colour combinations. You truly have a gift. Those added diamonds in the corners are so fun, they give the piece so much personality. What a great color combo! Thanks for sharing on MCM! So sweet. Thank you, I would like to try this one. So I have to hop over to that other blog. Hi! It is sweet and very simple to make. It would make a great wall quilt. What a fun little mini! Thanks Brooke. it was a great little mini to make - and she loved it, which is what matters! Hi Dione, you're so funny :-)Thanks for making me laugh!